It was 10 a.m. when this reporter—stubbly, lean, and careworn—leaned in his chair, scanning the news for topics of interest, and chanced upon the demise of a very great writer. Gripped suddenly by the inspiration to write, he composed, carefully and with no small degree of consideration, the story you are about to read. DETROIT—Earlier this hot and humid day, slim, craggy-faced author Elmore Leonard, the prolific novelist who was known for his terse prose style, as well as for advocating a method of writing that dispensed with unnecessary descriptive detail in favor of succinctness—arguing that needlessly flowery and detailed sentences, for instance, detracted from a work of fiction’s momentum and overall narrative impact—died at 87 years of age. 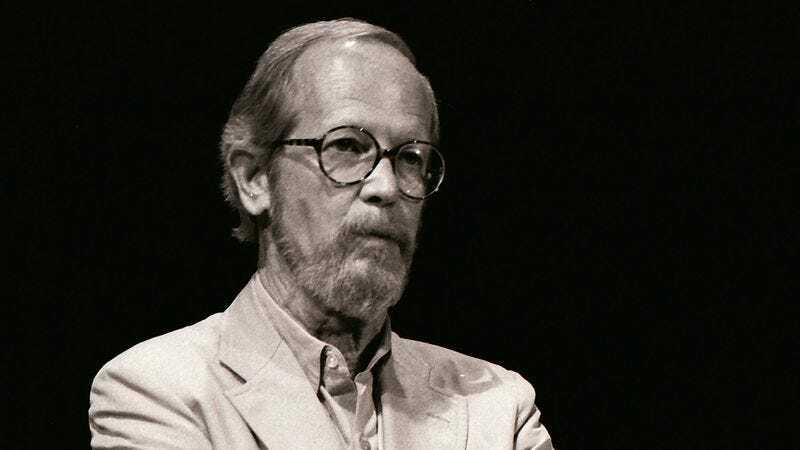 “Elmore passed away this morning at 7:15 a.m. surrounded by his loving family,” a source close to Leonard solemnly intoned in a brief statement this gray and muggy morning after the always bespectacled author, who wrote dozens of popular novels and screenplays from his beloved home in Detroit, the once-bustling city of American industrial power now crumbling under a near half-century of urban decay, suddenly died due to complications from stroke! “Yah, the stroke what he had dere was bad, but up ’til the end Elmore really gave ’er tarpaper, eh? Youse guys, 87 years old and still gon’ Shopko fer bodaydas. Holy wah!” Leonard, who joyfully married the pretty and petite Beverly Cline on a lovely day in 1947, is survived by five children, 12 grandchildren, and countless fans who seek to emulate his perfectly worded and concise, or perhaps the word is curt, or rather laconic, fiction, which was never better than in those narrative situations where tension is at a fever pitch, one character boldly utters something provocative to another, and all hell breaks loose.